Our Oat Delicacy Care Cream formula, blooms with the powdery-soft fragrance of Oat Milk & Rice Cream, bringing to life our wholesome, nourishing care for weightless hair. Rated 5 out of 5 by Cindyfrey from Excellent! I think Garnier Whole Blends Oat Monodose Hair Mask is the perfect hair mask! It smells amazing, makes my hair super soft, and super shiny. I absolutely love it! Rated 4 out of 5 by kiarajt from Soft silky hair don't care! I love this product. 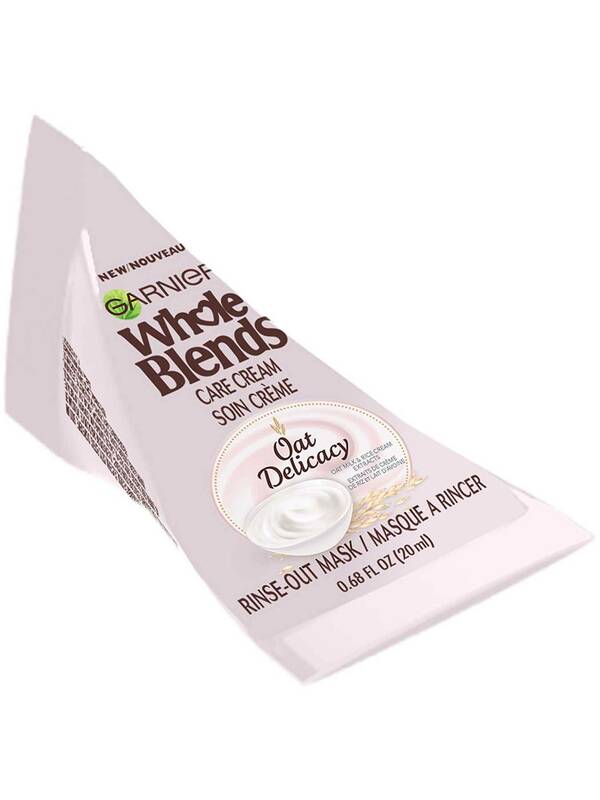 It was the first time I used this product from Whole Blends. It was easy to use and left my hair feeling soft and silky for at least three days. The scent was light and subtle, but I loved it. Rated 4 out of 5 by Eejjcc from Garnier Hair Mask This creamy, smoothing and moisturizing hair mask is a dream! Quite similar to Shea Moisture hair masks! Which I love dearly so this is another option! My hair is wavy,fine and porous and after a single use I noticed my hair was less frizzy and way more shiny! For those with fine hair I do recommend just using a dime size or else it can weigh down your hair and look greasy at the roots. Overall, great product and do recommend! Rated 5 out of 5 by Leelee01 from Simply Amazing I have dry wavy hair with a lot of frizz but thanks to #WholeBlends and the amazing oat monodose hair mask my hair looks and feels better than ever. The oat monodose hair mask is simple to use and smells great! The hair mask is thick so it saturates every strand but it rinses out completely so hair does not feel heavy or weighed down. It leaves hair moisturized, soft, silky and shiny! I love this product and will continue to use it! Rated 5 out of 5 by harmony37 from #WholeBlends I loved them they made my hair so soft and silky!! The feeling last for a couple of days ! Smells so yummy that I want to eat it! Really helps with my frizzy ends so another plus!! This was by far the thickest of all the conditioners I tried which tells you how great it is. I definitely recommend it! Rated 4 out of 5 by sheriefx from Fabulous Product This product delivered on what it promised, soft silky hair. I would definately recommend everyone try this product. 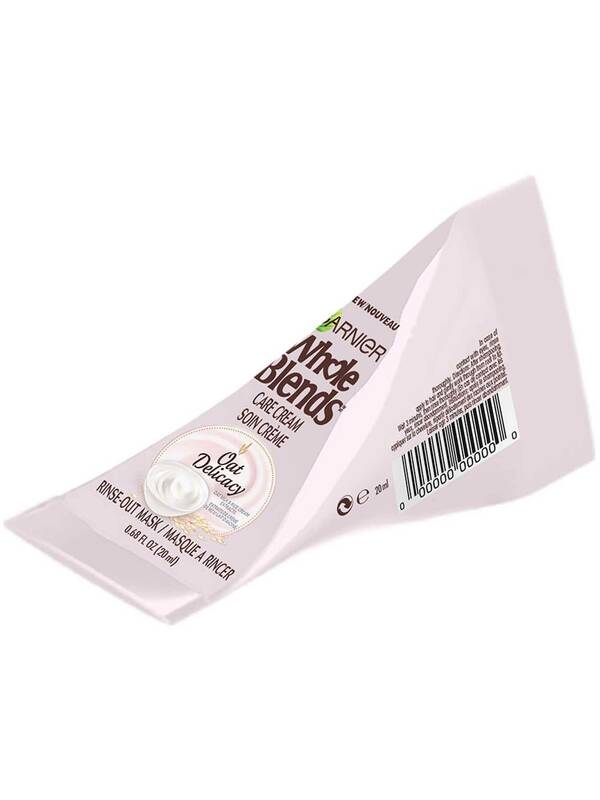 Rated 4 out of 5 by shereev from Nice and shiny soft I really enjoyed #WholeBlends Garnier Whole Blends Oat Monodose Hair Mask as it made my hair noticeably shiny and soft. Yes i would recommend to everyone to try at least once. Rated 5 out of 5 by Jasi28 from The best I have used the oat delicacy line on my hair almost 2 months now. My hair is very moisturized, smells good, very soft and silky, even promoted some hair growth. Very happy with these products. Hope to see a bigger size of the masque.